At first glance, the quilt might appear to be made from a bunch of squares that are sewn together in large sections. In reality, two variations of the Mosaic Four patch block are all it takes to assemble the quilt (see page 2). Blocks are placed on point and surrounded by setting triangles before borders are added. Mosaic Four Patch quilt blocks are easy to make, and even beginning quilters will be able to complete the quilt pattern with ease. Change fabrics to suit your needs. Before choosing fabrics, be sure to read through the pattern and look at illustrations so that you'll understand how blocks fit together. Choose a variety of prints, but do keep in mind the size of finished squares in each quilt block. Large-scale prints typically aren't the best choice for quilts with small patches, but they can be used in the setting triangles and borders. Fabric colors relate to my blocks, yours will likely differ. Pencil-in your changes. Yardages are a bit generous, but I always recommend buying a bit extra if possible to compensate for cutting errors and shrinkage. Splitting yardages for those who choose a different fabric for each area. Alternate: Buy 2 yards of a single fabric for lengthwise grain borders and use excess to cut setting triangles; cut (4) 5" wide strips along the length of fabric first -- reserve for borders. Cut squares for setting and corner squares last. 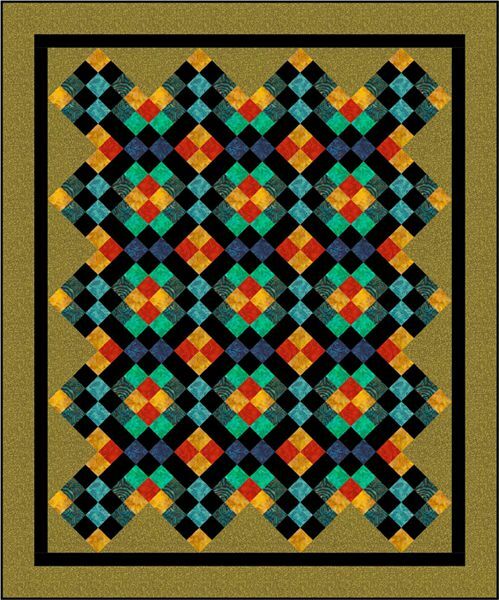 Backing: 4 yards, depending on configuration, or about 67" x 78"
Make 20 of the type A Mosaic Four Patch quilt blocks. Carefully press seam allowances towards the teal and the black strips. Square up one end of the strip set and then cut as many 2-1/2" segments from it as possible, likely 16. Make two more identical strip sets with remaining strips and cut a total of (40) 2-1/2" segments. You will have an extra length leftover when all are cut -- insurance for squaring up and for those little wibble-wobbles that can make some strips too narrow. Refer to the top right illustration. Create a strip set by sewing four strips together in this order: Teal - Black - Light Blue - Black. Square up one end of the strip set and cut 2-1/2" segments as before. Make two more strip sets and cut (40) 2-1/2" segments. Arrange two of each segment type as shown, bottom left. Like-segments are flipped around to create mirror images. Note: After pressing the first block to verify that its size is correct, you might want to press remaining blocks later, when they are aligned with others -- it might make it easier to press adjoining seams in opposite directions for better match-ups. Make a total of 20 Type A quilt blocks. Make 12 of the type B Mosaic Four Patch quilt blocks. Press outer seam allowances towards the red; remaining towards the green. Square up one end of the strip set. Cut as many 2-1/2" segments as possible. Make a second identical strip set. Cut a total of (24) 2-1/2" segments. Press outer seam allowances away from the green and black; remaining towards the blue (again, there's no true perfect way to press seam allowances). Make a second strip set and cut a total of (24) 2-1/2" segments. Arrange two of each segment as shown to create four rows, bottom left, flipping one segment in a pair to create mirror images. Sew rows together. Press now or wait until blocks are joined. Use a design wall or other flat surface to create seven rows with the two different Mosaic Four Patch quilt blocks. Blocks alternate within each row, but each row begins and ends with a block that has gold corners. Sew setting triangles to their row ends, matching their 90-degree sides with the straight side of each row. Press seam allowances towards the triangles and trim excess 'dog ear' fabric created by seam allowance at angled edges of the triangles.